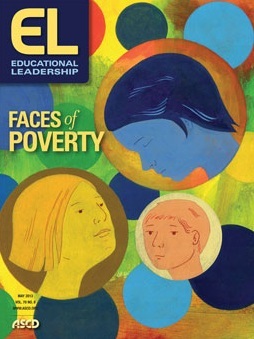 LitWorld Excecutive Director, Pam Allyn, shares her insight on organizing educators and school communities to fight against poverty in her latest article, "Raising Learning Warriors," published in the May issue of Educational Leadership. "Moses was my student in Brooklyn, N.Y. He came from Guyana, was 10 years old, and deaf. His mother, who spoke no English and knew no one in New York, had made the treacherous journey to the United States to give him the opportunity to go to school. He was the skinniest boy I had ever seen, with longer-than-long legs that he sometimes tripped over when he ran. Moses was not getting enough to eat at home, so I started bringing him food. Some days, he did not eat from the time he left me until the next morning at school. Moses and his mother lived in one tiny room where the heat sometimes did not work. His mother worked two jobs and was rarely home for more than an hour when Moses returned from school. Yet here he was, at long last, in a school for the deaf where he could finally thrive and learn." Read the full article to learn about five ways that we can equip children and schools to fight poverty. Newer PostHooray for the Hackley School!